Certified Kosher 16 ounce Kosher Aged in Wood Dill pickle. Our original pickle- the kind your grandparents used to buy from a wooden barrel at their neighborhood market. Available with or without garlic. Natural Flavors, Garlic, and Calcium Chloride. From Jon Duncan of Glenview, Illinois on 1/10/2019 . I always try to pick these up when I am in NE Indiana, but this time I ordered them via the website. They arrived on time as expected, they were perfectly packaged and undamaged in transit, and the pickles are terrific as always. I will say that with the shipping it becomes more expensive than I am used to paying for Sechler's pickles (the shipping is not free), but the extra expense worth it to me to be able to have access to these pickles! From Anonymous of Georgetown, Texas on 9/29/2018 . 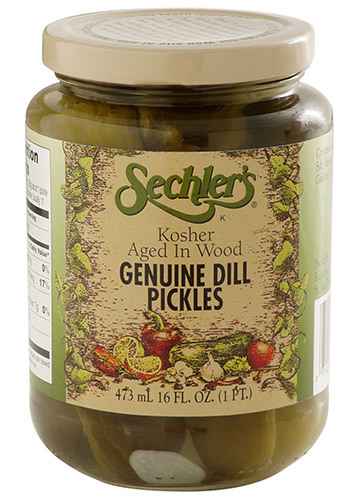 These dills are great deli pickles to go with ham,roast beef,pastrami,corned beef ,etc. Dills are the only pickles I use in potato salad or pasta and shrimp salad. Glad to have discovered these pickles. From BRIAN BELLAND of BOYNTON BEACH, Florida on 11/11/2017 . THEIR ARE THE BEST, WOULD LIKE THE DILL PICKLES TO BE IN BIGGER JARS. From Anonymous of Prescott Valley, Arizona on 8/11/2017 . Been ordering these for years, since we were able to visit your factory. You have shipped them all over the country with perfect results every time. Only problem is making a decision, they are all good. From Anonymous of Plymouth , Michigan on 2/4/2017 . Haven't had these pickles in a few years since the store that sold them near me closed. I couldn't stand being without so I bought a 12 pack. So good! Love the aged wood flavor. These pickles have a delicious vinegar bite to them. Great addition to my bloody mary's.